By the 6th Century B.C., Rome had been broken apart and was now under four different leaders. One of its leaders, the Consul of Rome Publius Valerius Publicola, was well loved by his people because he ruled for their good and benefit. However he had one opposition, a King named Lucius Tarquinius. Tarquinius would frequently rally other countries together to help him fight against the leaders of Rome. He use to be the King of Rome, but was banished when the Kingdom was split into four. Now he wanted his throne back. Tarquinius allied himself with Lars Porsena, King of the Etruscans and headed to Rome. They wreaked havoc all the way to there destination, a bridge called Pons Sublicius. It crossed the Tiber River and was the only way into Rome. As they passed an outpost, fleeing troops ran towards Rome for safety. When news of the fleeing troops and approaching army reach Rome, the people realized they didn't stand a chance against Tarquinius and the Etruscan army in battle. They decided the only way to stop him was to destroy the Pons Sublicius Bridge. But with the army already to close to finish in time, they came up with a plan. Someone would have to go and defend the bridge against the approaching army until the Romans could cut it down. Horatius, with equivalent rank to a colonel, stepped forward and said, “Give me two good men to help me, and I will hold the bridge and stop the enemy from coming over.” Immediately, two men, Spurius Lartius and Titus Herminius, ran to meet the challenge. All three of these men were of no small rank. The three Romans lined up on the other side of the bridge and prepared for the battle. The courage of these men was well needed, especially since the soldiers from the outpost, who put up zero opposition, ran past the three defenders to safety. As thousands drew up against these three men, they began to taunt them. They thought it was hilarious that three men would try to repel a whole army. So the Etruscans sent three of their own men against them. These guys were stout and able fighters. At the end of a fierce battle, the opposers lay dead. So three more Etruscans felt lucky and stepped up. These three Roman heroes put down anyone who dared to go against them. After a good bit of battle and many bodies lying on the floor, the bridge began to shake with the hacking of the beams. Horatius, determined that the bridge would fall soon, yelled to Spurius and Titus to run back while they still could. When the Tarquinius' army saw that the bridge was about to fall, charged the lone Roman. Watching this one Roman go against the army, you would think he was crazy. He used bodies as barrackads, dodged javelin attacks and returned their own javelins against them. They thought he was no less than suicidal. 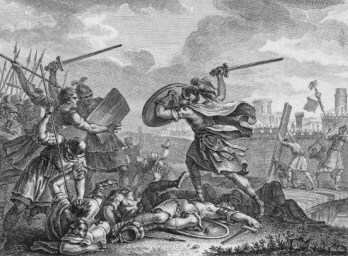 Horatius had been wounded pretty bad, including a spear lodged in his rear end. But just as the army reached Horatious the last beam was cut away and the bridge fell with a tremendous crash. As the bridge collapsed, Horatious leaped into the water with his hands stretched out praying to his gods. He survived both the falling bridge and the javelins that were thrown at him as he swam to safety. When it became clear to the enemy that he had made it, they applauded him. No matter what side they were on, they recognized Horatious' great act of heroism. The one Roman’s act stopped Rome from being sacked. He was praised for his bravery that day and made a respectable recovery. He also was given a portion of food from everyone in Rome, awarded with as much land as he could plow in a day and given an honorable discharge because of his wounds. Although this is not a Last Stand in the sense that he did not die on the bridge, he went out there with every intention of not coming back. When Consol Publicola recorded the event of that day, he stated that Horatious was like many men who “devoted themselves to death” to save the lives of their citizens. You may have observed that replica handbags connected with a lot less than 6 things, if equally competitors include profitable as well as getting rid of files, heightens your personal prospects to help get resistant to the pass on. That you will find a new betable problem. In a very twirl connected with luck this sometimes happens after you look at preceding solutions, you can definitely find and the second for being accurate and therefore household puppy a loss quite a lot mulberry replica resistant to the pass on.